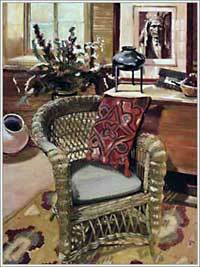 This painting was done on location at an interior designer's house in Boulder, Colorado. His eclectic taste made for an interesting composition. All art work in this web site is the property of Molly D. Davis and is protected under United States and Internationalcopyright laws. The images may not be reproduced, stored, or manipulated without the written permission of the artist.